The Center for Neighborhood Technology (CNT), based in Chicago, released in January “A RainReady Nation,” a report offering a suite of cost-effective solutions to prevent urban flooding. Launched in the summer of 2014, RainReady℠ is a CNT initiative established through years of working with homeowners and communities to better understand urban flooding. This experience gave the organization perspective on the difficulties faced by property owners in trying to prevent or recover from flooding. The core components to the RainReady program, as highlighted in the report, include home upgrades, community plans, and a flood alert system. First of all, the RainReady Alert component of the program is a real-time flood warning system that uses a network of strategically placed micro-sensors. 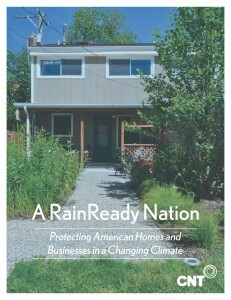 The RainReady Home component includes property assessments, construction oversight, and upfront financing. Projects could include downspout disconnection, green infrastructure, and more. An extension of the home upgrade, RainReady Communities includes larger-scale projects for whole streets and public spaces. The RainReady program and its solutions not only help prevent flooding, but also align with broader community initiatives, stimulate consumer demand for improved flood-resistant buildings, create jobs, and enhance resiliency. These solutions can empower communities to tackle flooding themselves. Low-income communities, especially, are often the hardest hit by urban flooding and can most benefit from less expensive flood solutions due to the significant barriers to investing in large-scale stormwater infrastructure.